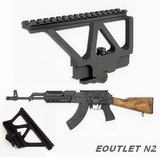 * Attaches easily to your AK with a built in AK receiver rail interface. * ADM auto lock system for no tool adjustments and repeat zero locking. Buy this item and earn 55 points valued at $4.41(inc GST).